We go hands-on with Spider-Man, and discover an open world of web-swinging, combat, RPG elements, and more. Each Spider-Man comic book cover tells the reader to expect something extraordinary. The artwork amplifies these commanding words, often showing the red-and-blue wall crawler soaring through the air, shooting webs, or pummeling evildoers. Just looking at the cover is an oddly exhilarating experience – a formula Marvel has successfully used since Spider-Man was first introduced in the 1962 comic book Amazing Fantasy #15. Spider-Man’s relevance has only grown stronger in the years that followed. He’s on the silver screen, on your TV, and in so many comic book series even the most ardent fans can’t keep them all straight. He just doesn’t have much of a pulse in video games, even after several titles from yesteryear showed us he’s a great fit for the medium. 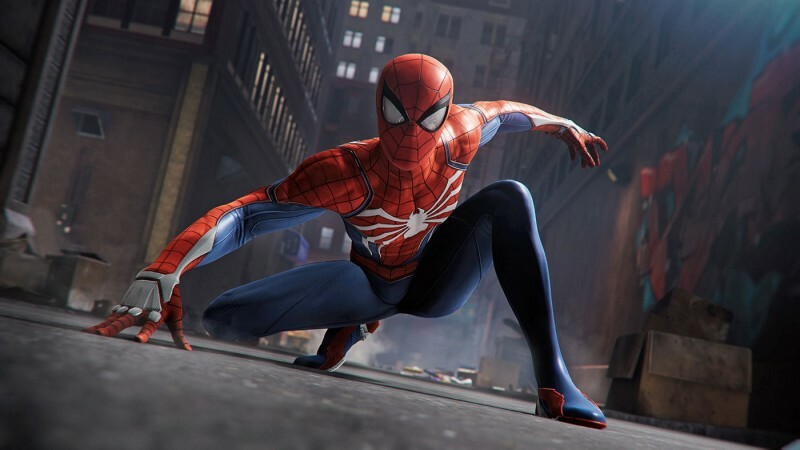 Developer Insomniac Games hopes to change this narrative with its own interpretation of Spider-Man – one that adheres to the decades of comic-book history fans have come to expect, but also explores narrative territory they wouldn’t. 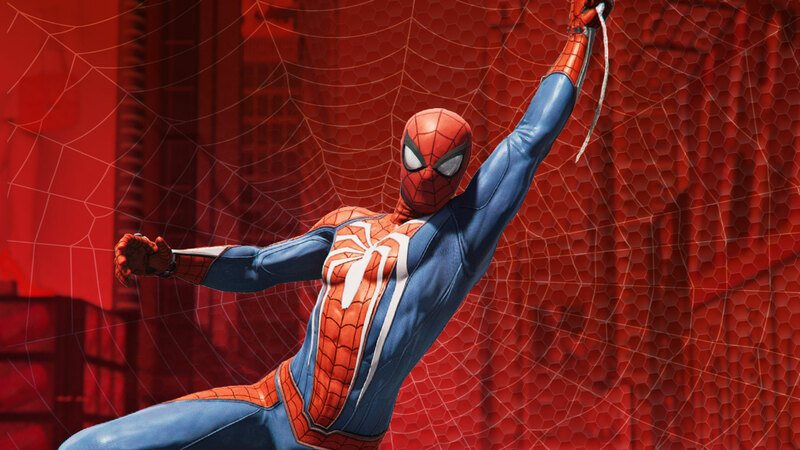 The fantasy every Spider-Man fan wants harks back to those comic book covers – snapshots of Spider-Man doing amazing things transformed into fluid gameplay. Insomniac delivers that Spider-Man dream, but isn’t afraid to focus on the man under the mask. 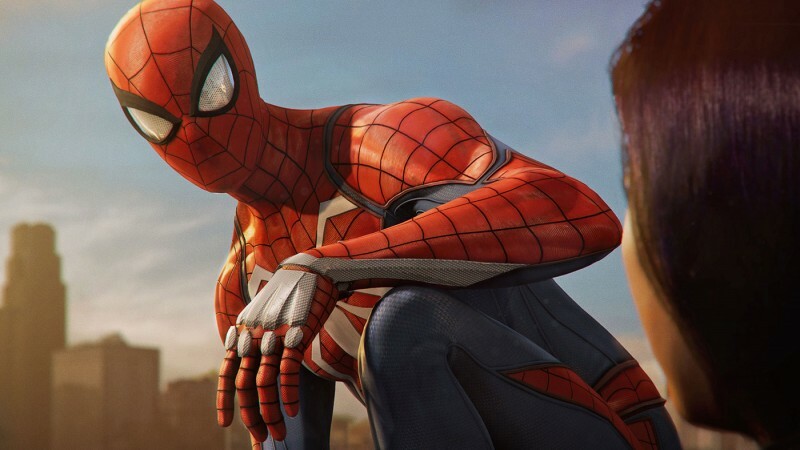 The studio also wants players to get to know Peter Parker, who deals with the issues many of us face every day: relationships, finances, and just being a decent human being. Almost every person I talked to from Insomniac and Marvel echoed one sentiment: The best Spider-Man stories are when Peter Parker and Spider-Man’s worlds collide. Peter gets a lot of face time in this game; you’re going to see the web-swinging action slow to a crawl to focus on his life. 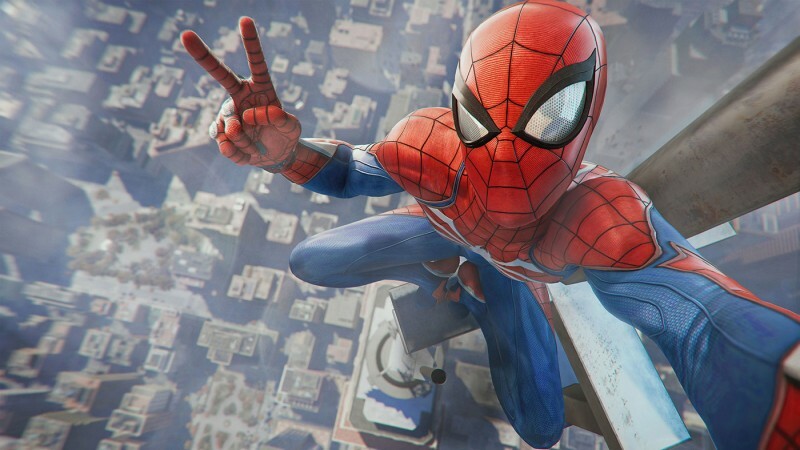 We got our hands on Spider-Man, and were shown just how Insomniac is trying to create interesting gameplay and moments for both the hero and the man. It all begins with an unexpected ending. Viewed from a certain lens, New York City’s skyline is a showcase of wealth and power. These billion-dollar towers lift the sinful fat cats and corrupt politicians closer to the heavens they’ll likely never occupy. They rule this city. They believe they are untouchable at this height. That was before the arrival of capes, spandex, and a 23-year-old struggling to pay his rent. Peter Parker has the power to clean up this city. In the eight years he’s been Spider-Man, he’s tangled with these tyrants, chipping away at their empires in a seemingly endless dance of violence and destruction. Today, one of them will finally fall and bring closure. 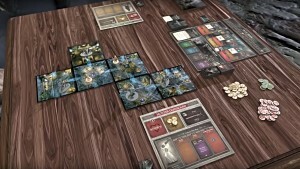 The first seconds of the game focus on a black spider twisting and turning as it descends on a thin line of silk in front of an open window, backed by vibrant sunlight. The camera slowly pans to the right, giving us enough time to see a series of photographs, the first showing the smiling faces of Aunt May and Uncle Ben, and a second a glimpse of a youthful Peter sitting with friend Harry Osborn and ex-girlfriend Mary Jane Watson. We then see Peter’s entire life come into focus in just a few seconds, moving from an old police scanner he uses to track crime, to a plant that appears to have died from lack of water, to a notebook with illustrations of web shooters and new gadgets, to a handful of Daily Bugle newspapers hanging precariously on the wall, each highlighting a different villain. The names and faces of Electro, Scorpion, Rhino, and Vulture are front and center. The tight framing of this shot echoes Peter’s lifestyle. He lives in a microscopic studio apartment, made smaller by a mess of clothing and food containers. You’d be hard-pressed to find one inch of this living space that isn’t occupied. Even in a partially awake state, Peter is quick to put on his web shooters, two high-tech devices he places on thin wristbands he nonchalantly wears about town. Before donning his costume – the iconic version from the comics with the black spider on his chest – he comically tosses two pieces of bread into the toaster and uses his webbing to snag them mid-air as they pop up, slightly browned. He scarfs down one piece, and suits up. Before leaving his apartment, he sees another eviction notice under his door. He hesitates for a brief second, debating if he should do something about it, but then turns his gaze to the police scanner, which has come to life and is barking out chaos. In the distance he can hear the roaring of police sirens racing toward their target. The earpieces in his mask also carry the voice of Yuriko Watanabe, the police chief and friend who has a lead on Wilson Fisk. Known in the criminal underground as Kingpin, Fisk has operated outside of the law, taking advantage of the inept bureaucracy of the city to gain considerable wealth and power. He hides high atop Fisk Tower, a massive landmark that flaunts the wealth of its owner with gaudy gold elevators, marble floors, and a giant, gold logo with heavy emphasis on the name Fisk. Insomniac says the white spider logo on the front and back of Spider-Man’s chest have meaning in the story, but wouldn’t elaborate any more than teasing it may tie into his scientific career. The flow of the red and blue are based on the makeup of the human body. After watching Spider-Man soar between redbrick high-rises and run haphazardly along the side of a metal railing, I suddenly find myself in control of him. Had the game not paused to deliver my first instruction of “Press R2 to web swing” I likely would have watched him fall to the street. 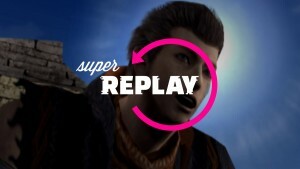 The transition between the cinematic and gameplay is seamless. 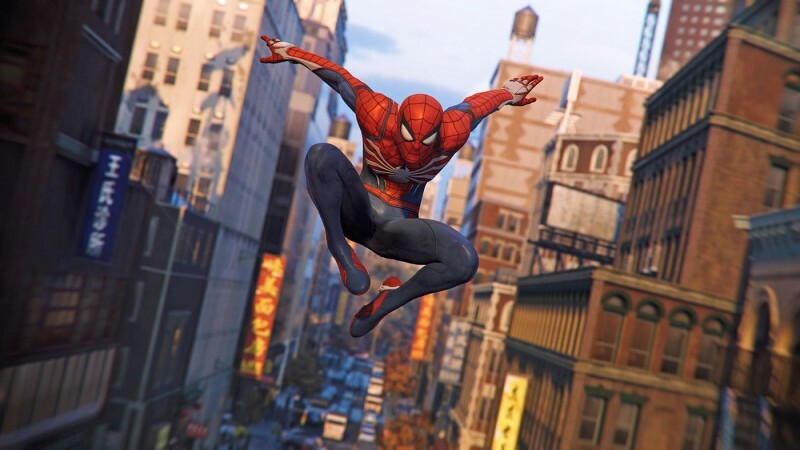 As Spider-Man’s weight pulls him closer to the street crowded with taxis, moving trucks, and citizens on the sidewalks, a web rockets from his wrist and attaches to a building to his right. Spider-Man’s momentum shifts into a long swing, concluding with him being launched high into the air. He spins every which way like a gymnast dismounting for a landing, gaining speed and height with each new web line that is thrown out. The sound of the wind howls as he moves across the city at a breakneck pace. Even though I just started playing seconds ago, the web swinging is easy to grasp. It has a nice rhythm and flow, giving me the precision needed to slide through narrow gaps. Holding L3 sends Spider-Man into a headfirst dive, a move used to gain even more momentum. Hitting X at any point of a swing or dive sends out a different web – more of a zip or pull – that alters his trajectory quickly, but is more of a transitional move to ease navigation. It can be used to quickly dart around corners. A red fuel truck approaches, and it isn’t braking. Holding true to the name “hammer,” the truck rams into the police barricade at such a force that the fuel tank is jettisoned and explodes. The police are knocked back, many now lying on the ground wondering what hit them. The gunmen use the moment of confusion to attack. They raise their guns to open fire, but soon realize they are holding nothing but air; a quick torrent of accurate web shots has disarmed the adversaries. Spider-Man lands at their feet, confident, and ready to fight. 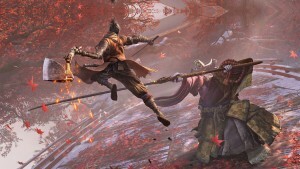 The combat sequence doesn’t last long, but is loaded with gravity-defying feats. When airborne, Spider-Man can pummel foes with his fists, use his web shooters to spin them up, then smash them to the ground where they remain incapacitated in a giant web. 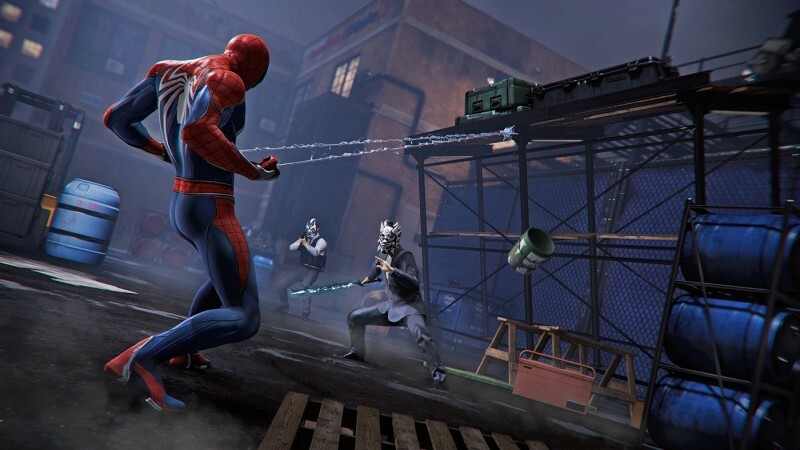 Other web moves are used to throw manhole covers and trash cans to knock enemies over. 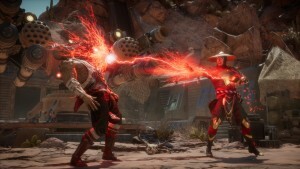 As wildly animated as the combat is, most of the actions are handled with a button press or two, and the timing windows are not always immediate, providing space for contemplation on how to dispatch a threat. Spider-Man moves fluidly, and can close the gap to his attackers with a web dash that puts him at their feet. His spider sense, which is illustrated with the iconic waveforms over his head, alerts him to incoming attacks, whether it’s close-range or a gun about to be fired from afar. He bounces between enemies like a pinball, so swiftly at times that it can be difficult to truly survey the battlefield or keep tabs on enemy whereabouts, as many of them are tossed around with reckless abandon. 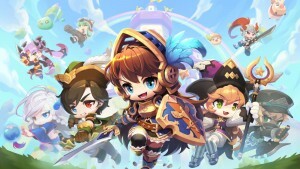 Regardless of the occasional confusion, the combat mechanics feel great, and allow for a high level of choice. 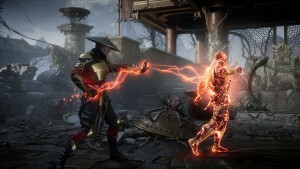 By performing well, the player earns the chance to slow the combat flow to execute a finishing move by simultaneously pressing the triangle and circle buttons. These one-hit takedowns are elaborate, showcasing Spider-Man’s wit and power through beautifully framed animation sequences. In one finisher, Spidey shoots two webs onto the ground, yet keeps them attached to his wrists to create a tight, elastic catapult to give him leverage as he plants his legs on the back of an enemy and smashes his face into the pavement. Reinforcements arrive via a dump truck, which again is shown through a breakout cinematic. They open fire, but I can disarm them with a quick web shot. After dispatching the last foe with a wicked swing kick that sends him twirling into a parked car, the battle moves to the steps of Fisk Tower. Yuriko and her troops are under heavy fire, and in desperate need of back up. She calls it in and requests the airspace be secured. Spider-Man arrives at her side, exchanges a few pleasantries, and then vaults into action after she gives him a vocal “Do your thing” sign of approval. Spider-Man gives her an excited fist pump in return. Yuriko instructs Spider-Man to get to the top of the building. Seconds later, the power to the elevators goes out – a problem for the police, but not for someone who can climb walls. Spider-Man briskly sprints up the interior elevator shaft, but finds himself at another impasse on a higher floor. Spider-Man is voiced by Yuri Lowenthal, the actor who plays Curt Connors (Lizard) in the new Spider-Man TV series, and was the Prince in Prince of Persia: Sands of Time. Peter Parker’s face is modeled after actor John Bubniak. Pressing R3 allows me to scan the environment. In this instance, the only thing of note is a ceiling vent just large enough to hold a person, illuminated with a vibrant gold hue. “Looks like my own private ventrance,” Spidey quips, as he crawls into it. In this tight space he receives a call from his aunt. His worlds are colliding at the wrong time. She immediately questions what the background noise is, and Peter awkwardly says he’s watching superhero movies, but will need to get back to her. Yuriko issues the alert that Fisk is wiping his servers to destroy evidence. Spider-Man’s mission shifts to salvaging the data. A giant display is positioned over the computer, projecting a countdown timer that comically ticks down to the data being destroyed. I have to act quickly to dispatch an onslaught of foes and race over to the terminal to stop the process and retrieve the data on a USB stick. Kingpin’s hired help gives Spider-Man a run for his money, but their numbers are quickly whittled away, prompting the angry face of Wilson Fisk to appear on the monitor, looking 100 times the giant he already is. He taunts Spider-Man, and the screen – both in the game and in my demo – fades to black. Insomniac didn’t want to show us what would happen next, but did give us a look at the outcome of this mission. We see Fisk’s hands behind his back in cuffs. After eight years of conflict, Spider-Man finally brought him down. As Fisk is loaded into the back of a van, he warns Spider-Man he’ll miss having him around. It’ll take just one month, but he’ll end up missing the relationship they had. This sequence shows Insomniac doubling down on this being a new Spider-Man story. The first mission brings the sense of closure you normally find at the end of most stories. It also produces uncertainty for what will happen next. For Spider-Man, he thinks he’s done the city a big favor and has helped restore order to it. What he doesn’t know is that, with Kingpin’s tyrannical reign over, it opens the floodgates for other villains to rise to power. For the time being, however, Peter has every right to celebrate. This is the point in his life he thinks he can finally find balance. His nemesis is behind bars in Ryker’s Correctional Facility, Aunt May is making a difference in the world with her work at a F.E.A.S.T. shelter, and he’s doing what he loves: working as a scientist for a company Intihar won’t reveal until the game ships. Insomniac gave us a glimpse at Peter’s relationship with his aunt through a story clip set in the early moments of the game. Peter and Martin Li, the philanthropist who opened the F.E.A.S.T. shelters, are preparing for a surprise party for May. Peter shows up late, and his aunt is already there, well in advance of the decorations being hung. Her presence complicates matters, but gives us a glimpse at just how awkward Peter can be out of the costume. The player controls Peter in this instant, able to interact with people and items in the environment. In a comical exchange, Peter tries to keep May distracted as Li and other people hang signs and balloons in the background. He tells his aunt he just wants to talk, which ends up being a bad idea, since she immediately asks if he’s in trouble, needs money, or if he is having girl troubles again. That last train of thought rolls into May wishing Peter and Mary Jane would have worked things out because they would have made such “beautiful bab–. ” Peter wisely cuts her off. He and M.J. have been on-again and off-again for years, but they haven’t spoken in over six months. Peter changes the subject to thank his aunt for all she’s done for him. Li echoes the sentiment, and says May was the person who in part inspired him. They spin her around to the applause of everyone in the room. Li toasts her for all of the work she’s done. 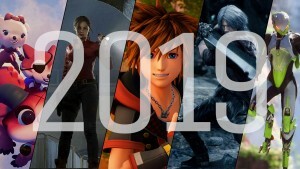 This story sequence plays out slowly, and is reminiscent in its visual direction and cinematic presentation to Naughty Dog’s Uncharted series. The characters aren’t just standing motionless. They move around and interact with each other and the environment in natural ways – little touches that seem trivial but give the story sequences a believable quality. In a familiar-looking shot from Sam Raimi’s Spider-Man film, we see Spider-Man dangling upside down on a line directly in front of M.J. This sequence won’t end with a kiss – she’s giving Spider-Man orders. 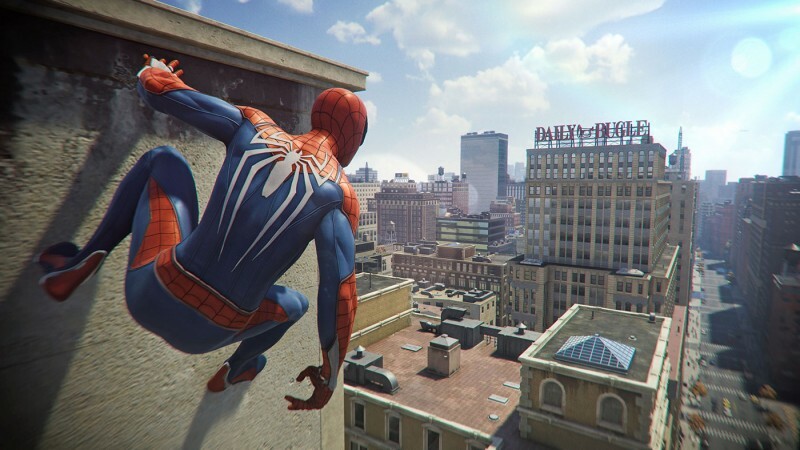 Once players have completed the main story, Insomniac is committed to keeping them engaged. The team’s “City Never Sleeps Initiative” brings numerous drops of post-release content, each featuring a villain, unique storyline, missions, challenges, and suits. The first one is called The Heist, and focuses on Black Cat set in a museum. 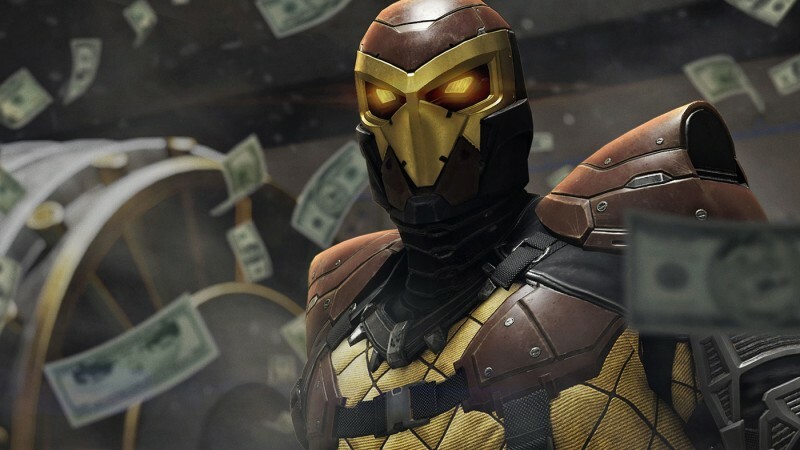 No pricing models were given for this DLC, but Insomniac says there won’t be any microtransactions for crafting materials or other in-game items. 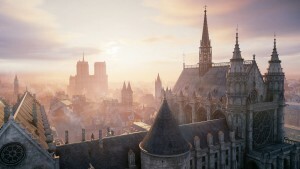 In fact, creative director Bryan Intihar said “hell no” to the possibility of microtransactions. Another relationship that emerges through the course of the game is with Miles Morales, who in the comics becomes Spider-Man. In this game, he’s a 15-year-old Spider-Man fan whose life becomes intertwined with Peter’s. The Osborn family is also present. Harry is overseas, yet stays in touch with Peter. 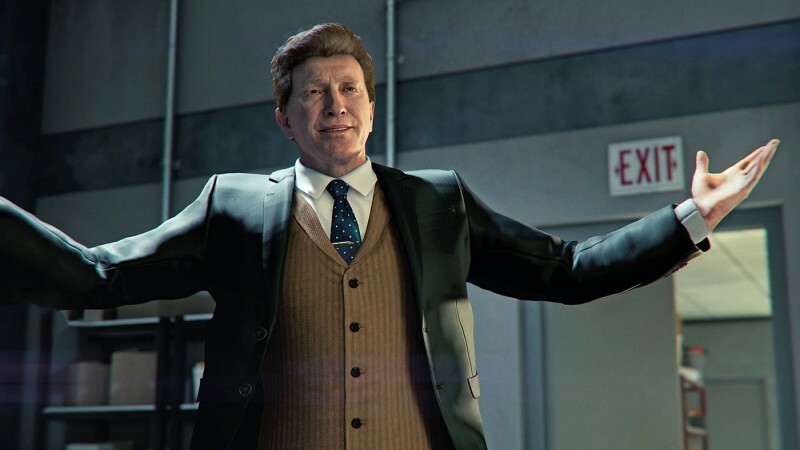 Harry’s father, Norman, rode the success of Oscorp to become New York City’s mayor. At the time of this game, he’s up for reelection. Many of these relationships sound a bit precarious; none more than one he shares with Li. When investigating a lead as Spider-Man, Peter learns Li, one of the nicest people he knows, can transform into Mister Negative, a villain who takes on the color of a photographic negative, has superhuman strength and reflexes, and can project negative energy like an oddly colored laser beam. He can also corrupt people, giving them negative energy, or drain their life essence to enhance his powers. Li is the leader of a group called the Inner Demons, masked adversaries who are far more formidable than Kingpin’s crew due to their negative weapons and abilities. They are rising to power quickly – targeting both Kingpin’s remaining strongholds and the hardworking people of the city. They want to destroy the Big Apple. We don’t see much of Li in our demo, but we do know he’s working fast, and he won’t let Spider-Man stop him. 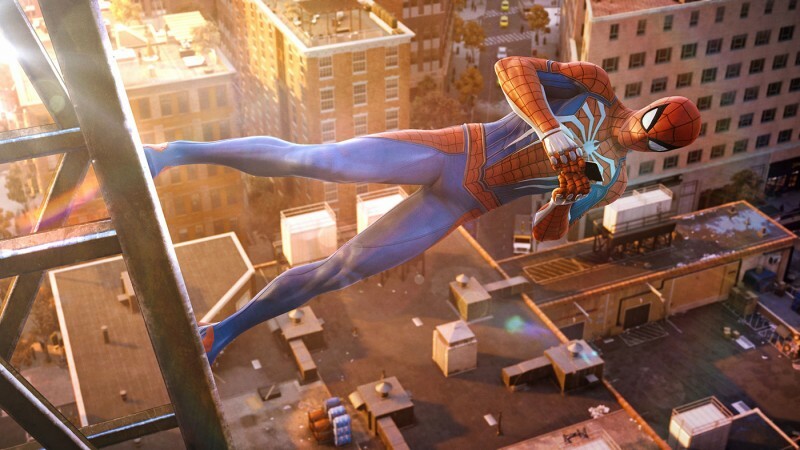 Insomniac’s version of New York City is a sprawling playground for Spider-Man to web swing across and climb, offering the verticality to stretch out his powers and the intimacy to ground his human side. In my hands-on time, I began by casually walking down the sidewalk, blending with the locals. They know him, and have accepted him as their own. One man yells, “What up, G? !” when I cross the street. A woman on the sidewalk wants to take a photo with me. I accept the request and pose with her for a shot. Other people show no interest in me, and are going about their business, some talking to one another, others are selling food or shopping. I veer off a main street into a small park with grass, trees, and a basketball court. A couple of squirrels dart past me just as I attach a web line to a basketball. After spinning it over my head a few times, I try to hit a three-pointer, but miss terribly. I point finger-guns at the people on the court and take to the skies. The city is enormous, and densely packed with objects and life – none of it disappears when viewed from a distance. My aimless exploration takes me by Grand Central Station, and I earn experience points for discovering a landmark. When enough experience is gained, Spider-Man levels up. Each level awards him skill points that can improve his abilities, such as a boost move that launches him faster and longer from a perched position. The speed of swinging can also increase with points. Along with Insomniac’s “Advanced Suit,” we saw three additional suits, most granting Spider-Man a unique, upgradeable power. If you like a particular suit’s power, you can move it to another suit. Along with classic suits, Insomniac says it has designed several that have never been seen before. This familiar suit’s power is quad-damage, which creative director Bryan Intihar says turns Spidey into a steamroller. When activated, his hands glow with fiery hues for a short amount of time. We played as this dark variation, but didn’t see its power in action. The classic suit is buried under a sleeveless jean jacket outfitted with a dozen-plus buttons. Spider-Man also has a mohawk of inch-long spikes on top of his head. This suit’s special ability is quite odd, and seems to fit more with Sunset Overdrive. Spider-Man whips out a guitar and strums it to send out a spherical shockwave attack that knocks down all foes. We didn’t see this suit in action, but did see an illustration of it on a wrestling poster in Peter’s apartment that pits Spider-Man verses Crusher Hogan. Odds are we’ll see this old-school suit in the game. The mini-map in the lower left-hand corner shows the street layout and also highlights side activities, of which there are many, and more are added as the game unfolds. The first one I stumble upon is a scavenger hunt. I just have to locate one of Peter’s old backpacks, which he webbed up in a secret location. I use the environment scan to locate it, and pull it down with a web. The backpack contains an image of one of Spider-Man’s first web shooters. Intihar says that in the final game, the backpack items help flesh out Spider-Man’s backstory with audio recordings. As I take to the skies again, I ping the environment and a series of colored icons appear. These are the activities that are near me. I can also press the touchpad to bring up the map to see everything, or place a waypoint on a destination. 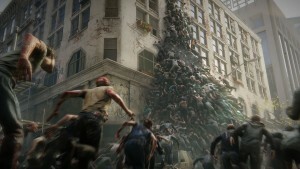 If a desired locale is on the other side of the map, I can fast travel, but I have to find a subway entrance to do this. After descending its stairs, Spider-Man rides the train nonchalantly, surfing his cellphone as he stands with other New Yorkers. Insomniac is creating a number of vignettes like this for fast travel, some tailored for specific things that happen in the game. A nearby rooftop holds a challenge from little-known villain Taskmaster, who I only see a headshot of. His mask is made of metal, much like Doctor Doom’s, but he still wears a hood over it, much like his comic counterpart. He has tasked me to locate and deactivate three bombs scattered across the city in a short period of time. When a bomb is reached, Spider-Man tosses it off of the building and the player must rapidly press R1 to shoot out web blasts to detonate it, which ends with a satisfying fireball. The webbing actually encases the bomb. The more webbing you apply, the higher your point total. When the task is completed, a statistic screen appears showing me how I fared. It also provides two bonus objectives. Completing the missions grants me a crafting component. Had I completed all of the objectives, I would have earned more. Intihar showed me a screen of a dozen-plus suit silhouettes, but quickly clarified that the number I was hastily trying to count wasn’t accurate, and there would be many (see “Not Just One Suit” sidebar). Other activities that reward the player with materials range from checking in on Harry Osborn’s Oscorp Industries Research Stations (each leading Spider-Man to different mini-missions) to Black Cat Stakeouts, in which Spider-Man must hunt for golden cat statues outfitted with surveillance gear. I found a cat tucked in an open window. When I was in range, I used a camera to snap a photo of it. The most challenging activity is tied to the Kingpin bases of note. Each of these locales is a hotbed of enemy activity. I approached a base high atop an unfinished skyscraper, and tried to use stealth to web up as many enemies as I could. I managed to wrap one heavily armed thug up into a web cocoon, but was spotted by the nearby guard. All hell broke loose, and a wave of enemies appeared onscreen. This encounter showed just how chaotic combat can be, as well as how crafty Spider-Man is in these instances. In keeping with most of Insomniac’s games, the player can hold L1 to bring up a gadget wheel. In my demo, it contained three items: a trip wire, web bomb, and standard webbing. The trip wire is a good tool for stealth, as it can pull someone to a wall and contain them. The web bomb is used for crowd control, as it rises from the ground, explodes, and showers webs onto everyone nearby, stunning them. Intihar also showed us the prototype of a fourth gadget: the Spider-Drone, a disc-shaped spider that hovers in the air and blasts out webs, sometimes incapacitating enemies. Outside of the standard web shooters, these gadgets are not infinite in supply, so the player must be savvy in their use. I do my best to put them to good work, but find Spider-Man’s acrobatic prowess to deliver the most satisfaction and success. As waves of enemies fall, more dangerous foes emerge, including a guard carrying a shield. He blocks most attacks, but if Spidey gets in close enough, he can dive under the brute’s legs and pummel him from behind. The final wave brings in the heat – an adversary armed with a rocket launcher. I’m told that later in the game Spider-Man can send rockets back at these attackers, but for now, good luck. I take the first rocket blast full on, and have to retreat to heal – a process handled by pressing down on the d-pad. This lifesaving maneuver drains my Focus meter, which I also use for finishers. My next attempt relies heavily on my spider sense to tell me when to dodge. I find a window to web zip over and launch the attacker off of the building. He tumbles a couple of stories before being pulled to the side of the building with webbing. 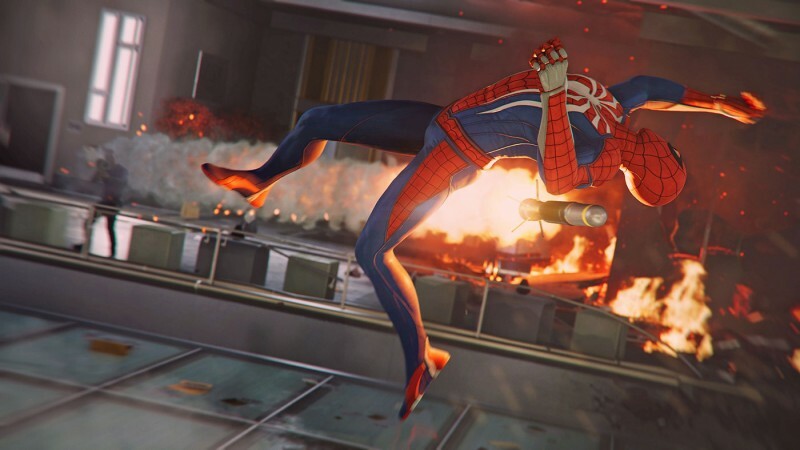 Spider-Man doesn’t kill, and the player doesn’t have to worry about these moments – they are automatically webbed up. Spidey also can’t harm civilians. He’ll just give them high fives, or interact with them in silly ways. As I explore the city more, I notice a red warning sign appear on my map, signaling a random crime is unfolding. These events are completely optional, and there isn’t a meter representing Spider-Man’s standing in the city. The crimes range from storefront robberies to high-speed getaways, none lasting long if you play your cards right. The storefront robberies feature small interior spaces – we saw a convenience and jewelry store – which house maybe five or six criminals. 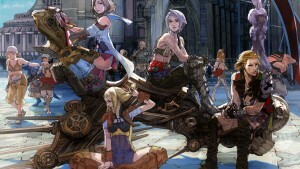 As you engage them, one of the enemies may try to take off in a car, a dynamic switch in how the random event unfolds. 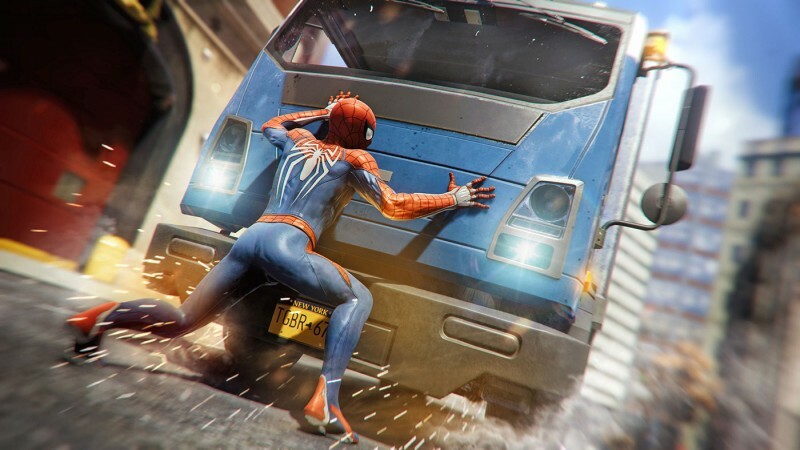 If this happens, Spider-Man must land on the roof of the car to remove the driver – an action handled through a quick-time event – or find another way to stop it. He can also land on the hood with force, shoot out webs to the sides, and stop it dead in its tracks, the car’s back wheels rising from the force. After taking down a variety of challenges, a gold marker appears on my minimap, and I hear Yuriko say Shocker was spotted at the bank. I arrive just in time to see him knock the giant, round door off of the bank’s vault with two huge arm cannons. This version of Shocker looks a bit like Iron Man, decked out in jagged armor, yet still retaining the maroon and gold colors. He engages Spider-Man, but the sequence fades to black, and my time with the game ends. Like the comic books that carry excitement on the covers, I walked away from Spider-Man with one word in mind: amazing. 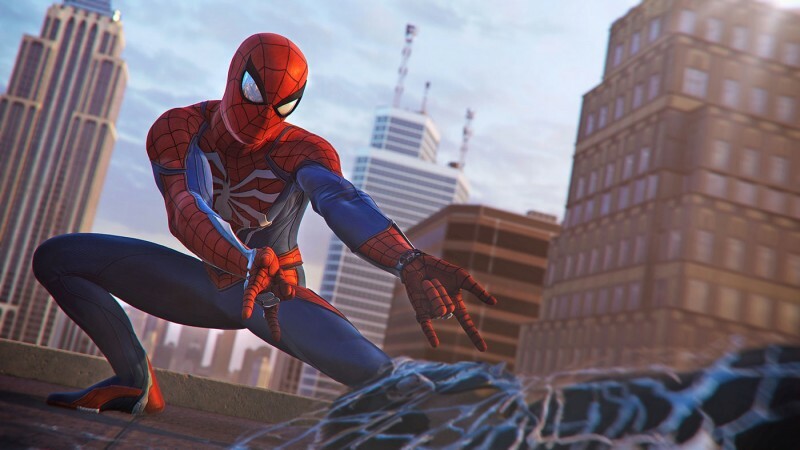 Insomniac Games is poised to do for Spider-Man what Rocksteady did for Batman. This is a fresh-yet-familiar take on this beloved character that is hitting all of the right notes. I only experienced a small part of what will be in the final product, but what I played is exactly what I want from a Spider-Man game. This article appears in the May 2018 issue of Game Informer.